Hiking on the trails of the natural reserve of the Aiguilles Rouges. 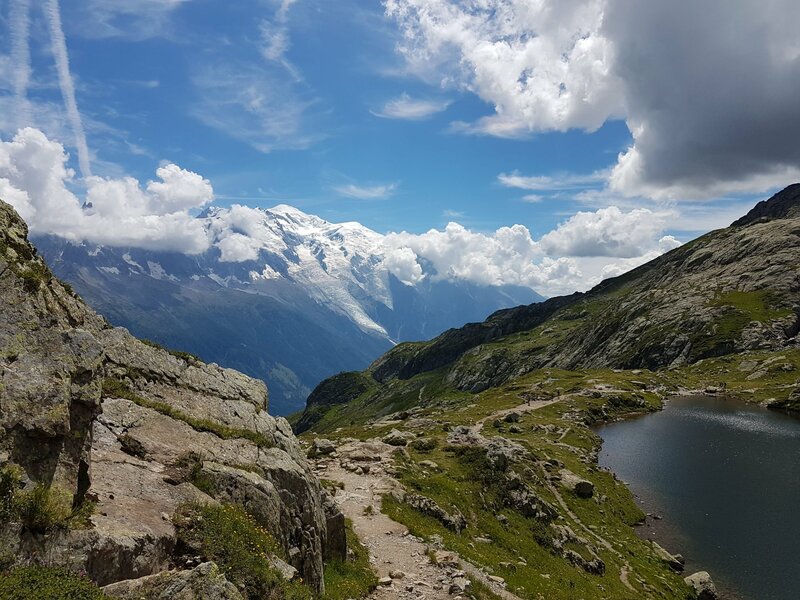 Overlooking Chamonix valley, our hike offers the most beautiful views of the Mont-Blanc range. We will spend both nights in huts to spice up our adventures and fully immerse ourselves in the special atmosphere of our mountains. We carry all our belongings in our backpacks, and use local buses for transfers. We sleep in huts in dormitories. Food and snack supplies are available from mountain villages and huts. Departure from the Bettey above Les Houches village located in the Chamonix valley. We will join the Aiguillette des Houches (2285m) going through Pierre Blanche. We are now in the natural reserve of Carlaveyron. The trail continues along the ridge to the Aiguillette du Brévent, those are the first ledges of the Aiguilles Rouges that will allow us to reach the pass of Bellachat and finally the hut of the same name. We will sleep facing Mont-Blanc and its imposing Glacier des Bossons. We will continue our journey over the Aiguilles passing through the summit of Brévent (2525m) which offers a magnificent panorama ! The trail then descends to the altitude of 2000m, in Plan Praz, then crosses to the Flégère. The trail offers some very nice views across the Mont-Blanc. The scenery is great. A beautiful climb in the rhododendrons leads us to the Lac Blanc. Once again, the show is unique. We spend the night at the Lac Blanc hut facing the Mer de Glace (2352m). We will continue to the Perseverance lake. Surely, we will cross a few mountain goats. Then, continuing our traverse to the Cheserys lakes to fully enjoy the different panoramas that the trail offers. Argentière Glacier, summit of the Aiguille Verte … We descend to the Col des Montets, then to the Argentière village. We will have crossed the entire Aiguilles Rouges range facing Mont-Blanc massif. The guide may have to adapt the route to weather conditions and/or to group physical and/or technical ability. July 8th to 10th - August 26th to 28th. At 8.00 am in front of the Compagnie des Guides de Chamonix. You are welcome to come and meet your guide the evening before at our office at 6pm. 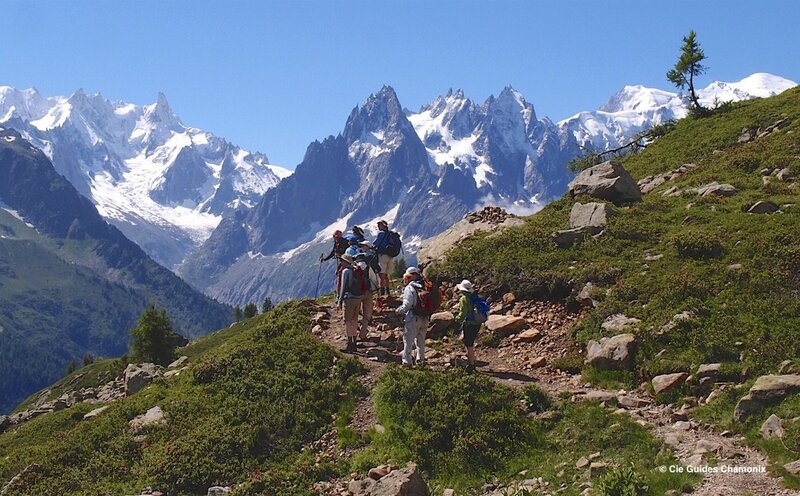 2/5 - Chamonix Valley hiking trip is a moderate trek. A minimum of 700m (2350ft) vertical gain and about 5 to 7 hours of hiking daily. Hiking on generally well-maintained mountain trails, sometimes including easy out-of-trail sections. For active people who don’t mind training to prepare for the hike. 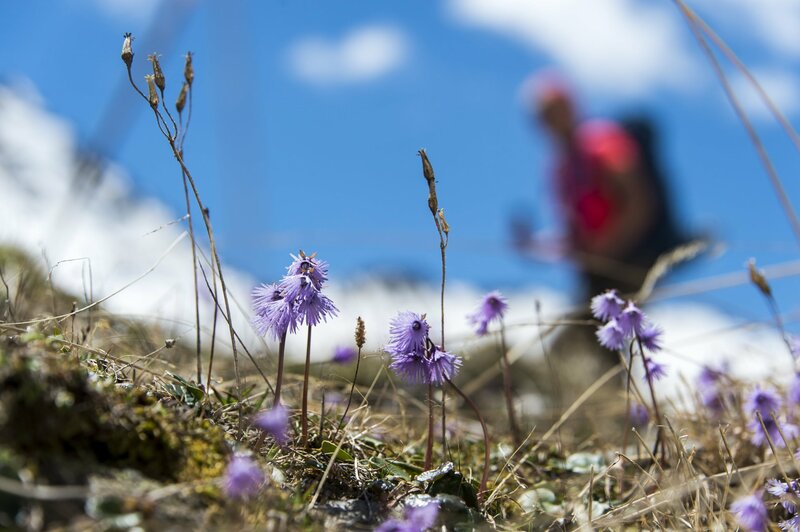 A great multiday hike for people with trekking experience. Recommended minimum age: 10 years old (children accompanied by parents). Minimum 6 and maximum 10 people per guide. No booking accepted in our scheduled groups for people under the age of 18 without a legal guardian. 2 nights in a hut (small dormitory). Each hiker carries all his personal belongings, and the picnic along the entire trek. Participants must have an insurance with repatriation cover. Cancellation insurance is highly recommended. You can take out insurance offering both of these types of cover when you sign up. Participants must also take valid ID with them. - Ankle supporting boots with notched technical rubber sole (i.e. VIBRAM). - We strongly recommend wearing new boots (several days and preferably hiking) to break them in before the hike. - Minimum size recommended 40 L (bigger is better than too small). - Take out lunch should fit AFTER packing all your personal belongings. - Bad weather precaution: pack covers are great to protect pack from rain or snow. We also recommend packing your belongings in a large and solid plastic bag (i.e. garbage bag) for a better protection in case of heavy rainfall. Taking enough time to pack is essential, as you are going to carry every item for several days in a row. Avoiding extra weight can easily be done by packing your clothes tightly, placing heavy items at the bottom of the pack, and avoiding empty spaces. As a result weight is better spread throughout your back and weight impression diminished. Your back pack should not exceed 19 pounds (9kg). - Sun hat or ball cap, sunscreen, sun glasses, lip protection. - ID card or valid passport + small change/ bills for personal expenses. ** Elastoplast (stretchable strapping tape), band-aids, second skin, medicine for common aches and pains (diarrhea, headaches, sore throat…) Don’t forget to bring your personal prescription treatment if you have one. Mountain leaders also carry a complete first aid kit. Remember that packing light is essential. You are a private group, you can ask for a customized trip. A more individualized relationship between your group and the professional. You can choose your date of departure within the limit of the hut availabilities. Depending on weather conditions, your level and your expectations, the guide can suggest you some different options of itinerary. Second part of the famous "Traversée des Alpes" : The Northern Alps. Lightpack version. Second part of the famous "Grande Traversée des Alpes : The Southern Alps". Lightpack version. 6 days of hike - Minibus assistance - Night in dormitory. A confort version of the TMB : 6 days of hike - Minibus assistance - Night in room.